“People can find all kinds of reasons to be divided today. But we found one to be united.” Matt Gaylor, engagement pastor of the new Nspire Church in Westfield, Indiana, couldn’t be more excited about what God is up to in the growing city just north of Indianapolis. As the pastor who helped restart and reclaim New Life Church of God as CitySpring Church in the early part of this decade, Matt had every reason to continue down the successful path he was on. But God had other plans. These plans wouldn’t involve him leaving CitySpring, but they would involve change. And they would prove to be a powerful witness for Christ. “Because, after all, Jesus is the subject,” Pastor Matt explains. For two years in a row, CitySpring had been named Partner of the Year by the city. As the hands and feet of Jesus, they’d established themselves as a resource for the community, as well as a friend to the community. When the city needed help with one project or another, CitySpring was there. When neighbors needed assistance, or a particular issue of concern in the community needed addressed, CitySpring was there. But another church was there, too. At the same time CitySpring Church was reaching out into its community, Imagine Church, led by Pastor Brad Ruggles, was doing the same thing. Jesus was the motivating force behind both churches, and both churches were aiming to make disciples. No doubt both churches believed in the doctrine of unity. Aiming to live out God’s love in their community, both churches were seeking to fulfill the same mission—separately. Soon it became clear to both pastors that something wasn’t quite right with this picture. Theoretical unity became functional unity. The two churches decided they ought to come together for a one-time unity service. Because everyone loved it, they held another unity service. They started doing service projects together, rather than separately. Within a few months, it was becoming clear that God had so much more for the two churches than occasional get-togethers. God wanted the two to become one. This summer, the two churches did a “practice run” and experienced a six-week teaching series together. Because neither church had their own building, meeting together at a school felt threatening to no one. Insightful conversations with Healthy Growing Churches took place, and the decision was made to merge the two churches—one, a Church of God congregation; the other, a Missionary Church. Jesus is the subject. Photo: Nspire Church awarded for their community partnership. Recent months have given the two churches the opportunity to prepare for an official launch on January 22. Both churches had name recognition in the community, so Nspire Church decided it would not confuse the community into thinking two churches had left town. 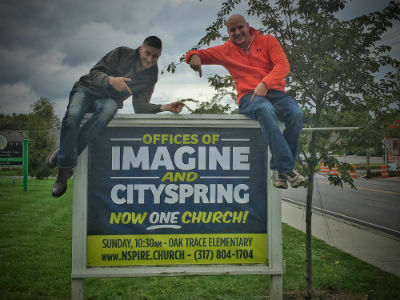 During this transitional period, signage and communication has gotten the word out that CitySpring and Imagine are uniting. By the January launch, all of the signs will be changed to Nspire Church. Because Matt and Brad have a great working relationship and friendship, co-pastoring made perfect sense. Brad, who is gifted strongly toward discipleship, will be the formation pastor. Matt, an extroverted leader with extensive community connections, will serve as engagement pastor. 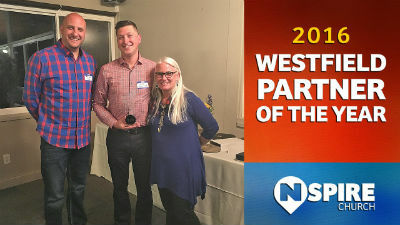 Nspire Church hasn’t even officially launched, but they were already awarded Westfield’s 2016 Partner of the Year! Now the new-but-not-really-new church with a unique name is also preparing to find a space of their own to lease in the next six months. This entry was posted in All Church of God, Great Lakes and tagged Brad Ruggles, church plant, church planting, CitySpring, community outreach, community partnership, functional unity, Healthy Growing Churches, Imagine, Indiana, Matt Gaylor, merge, merger, Missionary Church, New Life, Nspire Church, revitalization, Westfield. Bookmark the permalink.